Darren Pritchard’s Rent Party was programmed as part of our IGNiTE theatre and dance Spring Season. Maya Ilogu, aspiring actor and Bristol resident has been blogging about coming along to our IGNiTE performances and workshops this Spring. 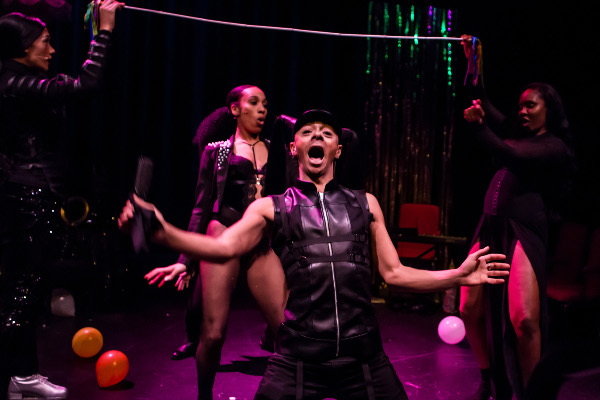 Read her latest instalment on Darren Pritchard’s Rent Party, that we like to call ‘come dance at Rent Party, even though you’ve not done this type of thing before’. On the 16th March I attended both the workshop and performance of Rent Party. When I arrived I went straight into the main theatre; which was where the workshop was being held. "As a person of colour living in the UK the show was relatable and they talked about a lot of issues in the UK"
During the workshop I learnt some choreography which I found out was going to be a part of the performance. This is something I didn’t expect to be doing and I don’t have a lot of experience but it was really fun to learn and to be a part of. We learnt the choreography step by step and rehearsed with the performers. The performers were doing it with us and so we had someone to follow if we were unsure of the steps. It was all fun and not taken serious. We had to keep the fact that we are going to be a part of the performance a secret to make it look like a flash mob. I really liked the choreography - it wasn’t too complicated and was fun to learn and do. we went out to the main entrance just before the show was about to start. The performance began; it was set out like a rent party, party games, music and dancing which meant you couldn’t help but want to join in. In the show they each told their own story and experiences of growing up in the UK as a person of colour and the issues they had to overcome. We were given play money which we would give to the performer we thought deserved the money at the end. The show in general was inspiring and gave me motivation to get to where I want to be. Something I really like about the performance was that it was really energetic, fun and everyone could get involve. As a person of colour living in the UK the show was relatable and they talked about a lot of issues in the UK but they didn’t always say them in a serious way which meant they kept to the theme of their performance. This performance was appealing to everyone and was nothing like I had ever seen before. Before I came to the workshop and performance I didn’t know what to expect other than it was going to have a party vibe and there was going to be music and dance. So I was excited to see what was going to happen. From a young person’s perspective, who wants to get into acting and performance, it was great to take part in and learn from. I learnt new choreography and gained confidence in performing infront of others. I got a better understanding of different types of performances. You can read more of Maya's blogs over here.